NuDesign SNMPv3 Agent Service is a seamless upgrade of Microsoft SNMPv1/v2c Agent Service to secure SNMPv3. The product comes with a redistributable SNMPv3 Agent Configuration Applet. 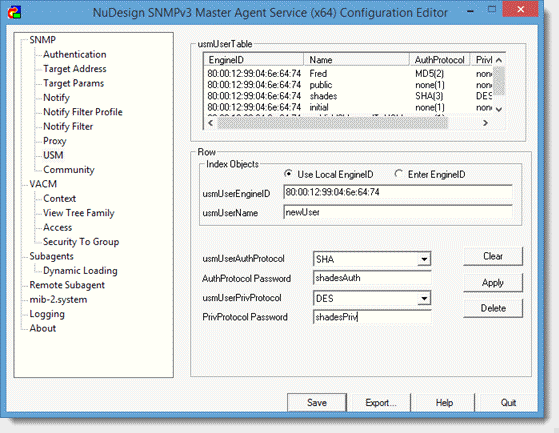 All extension DLLs that run with Microsoft SNMP Agent Service will run with NuDesign’s SNMPv3 Agent Service as well. NuDesign’ SNMPv3 Agent Service operates over IPv6 and IPv4 networks providing for secure monitoring of Windows Servers and Workstations. Servers: Server 2003, Server 2003R2, Server 2008, Server 2008R2, Server 2012, Server 2012R2 and Server 2016. Workstations: XP, Vista, Windows 7, Windows 8/8.1 and Windows 10. Note: The NuDesign SNMPv3 Agent Service, starting with rev. 14.0.0, supports the SNMPv3-FIPS140 mode, in addition to its existing SNMPv3 mode. The support for Windows XP / Server 2003 for SNMPv3 Agent Service rev. 14.0.0 and up has been dropped. However, Windows XP and Server 2003 are supported on all SNMPv3 Agent Service versions up to release rev. 13.x which will continue its maintenance cycle as required. Please see the SNMPv3 Service’s respective Release Notes rev.13.x and rev.14.x & up for more details. NuDesign’s secure SNMPv3 Service is fully interoperable with Informant Systems’ SNMP Informant DLL’s. Informant Systems is our Technology Partner and its product line is focused on monitoring of Windows Servers installations. Review the SNMPv3 Agent Service Technical Brief, information about the Mass Deployment in a production environment and download a fully functional eval. Please also review the tutorial which demonstrates configuration of the Service. For detailed configuration information please download the SNMPv3 Agent Service Help file. Right click over the downloaded “CHM” file, select “Properties” from the menu and “Unblock” the file to gain access to its content. Starting with the rev10, the SNMP Service and the Configuration Applet are available as two separate products: the 32 bit version working with 32 bit extension DLL’s and installable under either 32 bit or 64 bit Windows and the 64 bit product working with 64 bit extension DLL’s and installable only under 64 bit Windows. Both versions of Service can co-exist on 64bit host, handling SNMP querries to their respective extension DLL’s, provided that each agent is bound to a different IP address / port number pair interface. For example, they could share the same IP address and differ in port being used for SNMP communications (ie 162 for one agent and 8162 for second agent). NuDesign’s companion product, Visual xAgentBuilder 9 for C++, a code generator and a core component of SNMP Agent Studio 9 for Windows generates 32bit and / or 64bit extension DLL subagent code and builds project for VS2008 and higher (including VS2015) automatically, for any standard or custom MIB. The developer supplies only the final object instrumentation methods code. The full feature, free eval of Visual xAgentBuilder 9 for C++ is available for download at NuDesign’s site at www.ndt-inc.com. NuDesign SNMPv3 Agent Service comes pre-configured with default SNMPv3 users, the same ones that NuDesign Visual MIB Browser Pro is pre-configured with, for instant “out of the box” SNMPv3 communications. Configuring LoriotPro for SNMPv3 communications with NuDesign SNMPv3 Agent Service (version française du document). Configuring SolarWinds for SNMPv3 communications with NuDesign SNMPv3 Agent Service. Configuring WhatsUp Gold for SNMPv3 communications with NuDesign SNMPv3 Agent Service. Configuring PRTG for SNMPv3 communications with NuDesign SNMPv3 Agent Service. Configuring Castlerock SNMPc for SNMPv3 communications with NuDesign SNMPv3 Agent Service. Configuring HPE’s Intelligent Management Center for SNMPv3 communications with NuDesign SNMPv3 Agent Service. It supports SNMP v1/v2c/v3 access to MIB management objects via Microsoft’s Extension Agent DLL architecture. A full SNMPv3 support is offered, v3 security (CBC-DES, 3DES-EDE-CBC, CFB128-AES-128, CFB128-AES-192 or CFB128- AES-256 privacy and HMAC-MD5, HMAC-SHA or SHA224/256/384/512 authentication) and v3 Administration Framework for Notifications (implements SNMP-TARGET-MIB and SNMP-NOTIFICATION-MIB). In SNMPv3-FIPS140 mode it restricts the use of Windows’ crypto modules to only those that are compliant with FIPS-140 standard. Support for either the 32bit legacy extension DLL’s in both 32/64bit Windows environments or new 64bit extension DLL’s in 64bit Windows environments. Please read more here. Support for HPE Insight Management Agents software, containing HP SNMP Extension Agent DLLs and associated services, including support for specialty networking cards such as a line of HPE FlexFabric and other vendors versions of 10Gb 2-port Emulex networking adapters for Windows Servers. * HPE, HPE ProLiant Server, HPE Integrity Server, HPE Insight Management Agent, HPE FlexFabric are a registered trademark of Hewlett Packard Development Company, L.P. Emulex is a registered trademark of Broadcom Ltd.
Support for virtual networking interfaces, that need not be active at start up, but will be added to the bound service endpoints, when they do become active. These interfaces can be associated with Windows Server’s redundant “Server Application Roles” that only get enabled if a primary Server for such an “Application Role” goes down. It provides full support for “SNMP over IPv6” as well as “SNMP over IPv4” networks. It allows extension DLLs to be started or stopped dynamically, without interrupting the Agent Service, with the help of NuDesign SNMPv3 Service Configuration Applet. Microsoft SNMP Agent Service needs to be stopped before a new extension DLL is added or an existing DLL is removed. There is no such restriction with NuDesign’s Agent Service. It supports the use of remote subagents, either the lightweight subagents based on UDP communications and SNMP BER encoding, or the TCP/IP communications based subagents using the IETF Agent Extensibility, AgentX – rfc2741 standard. The NuDesign SNMPv3 Agent Service can be deployed as a Master to control a network of desktop and / or embedded devices equipped with AgentX remote subagents. It provides full support for all SNMP notification types (v1/v2 traps and informs including a callback mechanism that provides extension agent DLL with status information on sending informs). Please read more here. It fully implements SNMP Proxy Forwarder Application as per rfc3413. It is a multithreading service. One thread is always listening to incoming requests and other threads are responsible for satisfying the requests. With this architecture, SNMPv3 Agent Service is never blocked. It has been built using Standard C/C++ libraries, can therefore be readily ported to numerous embedded environments. The NuDesign SNMPv3 Service for Windows, in conjunction with Windows native and 3rd party extension DLLs and NuDesign’s Visual xAgentBuilder for C++, a custom extension Agent DLL Builder, provide a comprehensive and secure monitoring solution for Microsoft Windows Servers and Workstation products. The Annual Technical Support and Subscription Service Contract provides one year of product enhancement and maintenance updates plus access to our engineering team (please review the terms here). For more details please see our Purchase SNMPv3 Service page.